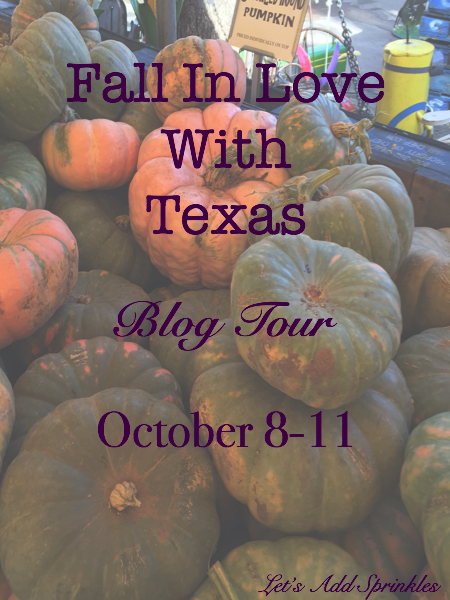 Welcome to the third Fall In Love With Texas Blog Tour. We are so happy that you have stopped by. I'm kicking off the tour with a peek at my home. 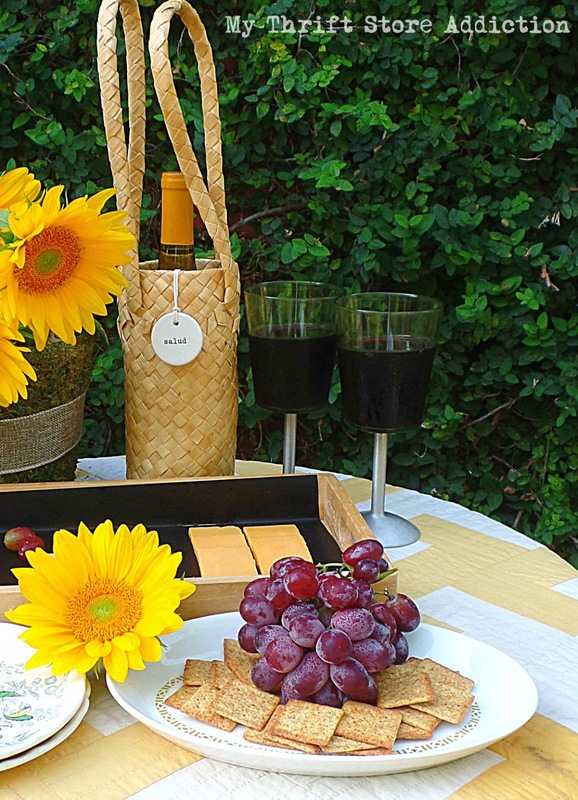 A Pottery Barn Sunflower pillow was the springboard for the color scheme. I used a gift card that I'd been hoarding. It's a fun use for it. This may be the first time we have had a higher end pillow as a catalyst for our fall decor and it is worth the splurge. Anything with a golden hue was commandeered for our 2018 decor. An IKEA Hermine Throw and a gold pillow from Magnolia Market dress up the brown leather chair. A gold throw made by my grandmother in law and a velvet pillow grace the chair opposite the fireplace. 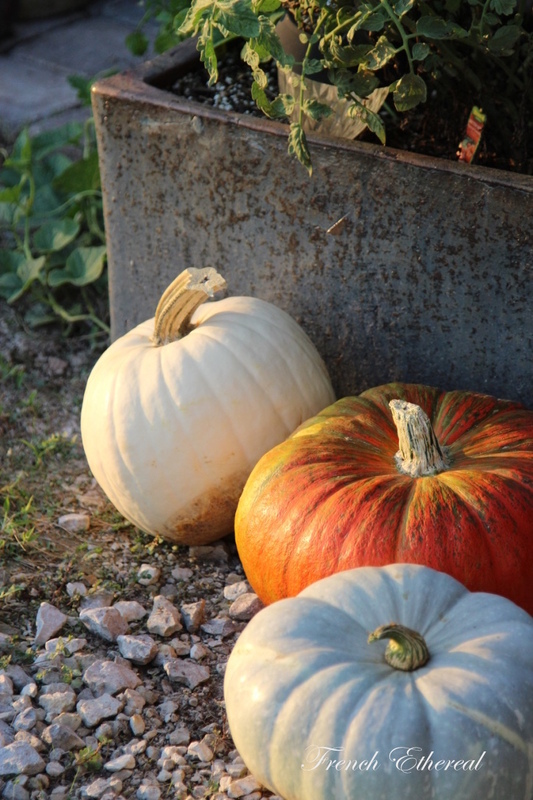 A cute heirloom pumpkin rests on the antique child's school chair. 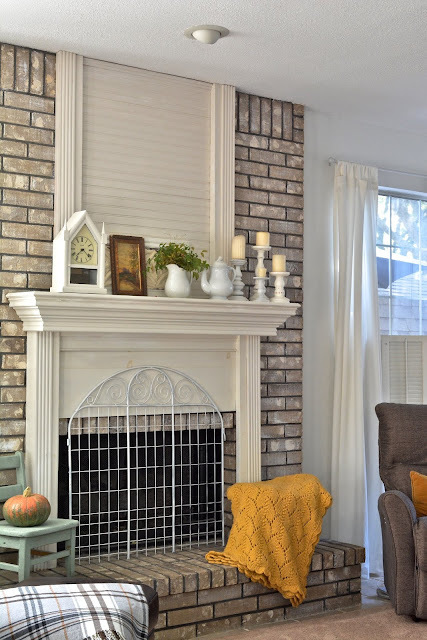 The mantel hosts iron stone, an antique ceiling tin and a beloved painting from my mother in law. The old gold tones and the purple tree in this old oil painting are perfection. 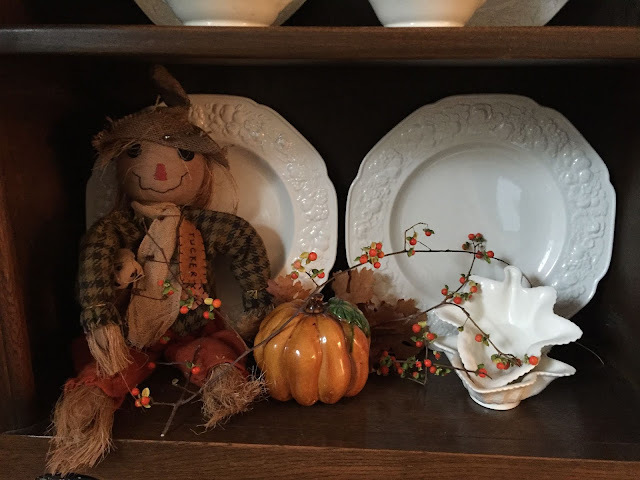 Knick knacks with a nod to fall were swapped with other pieces. Nandina branches from the garden fill up vases and pitchers. Their leaf tips are best when they start to turn from green to coral and then red. The cloches were going to get packed away but I fell in love with their vignette potential on the piano. 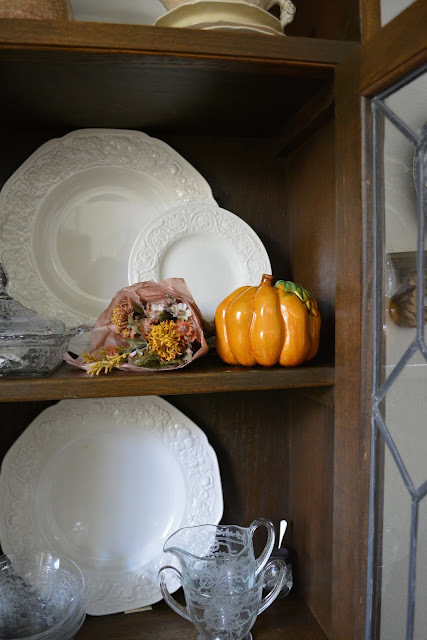 The dining room received a few of my favorite fall faux accessories. The dish dresser is decorated with Florentine by Crown Ducal. It sets a lovely cream ground for a few beloved pumpkins. The ceramic pumpkins came from Hobby Lobby many years ago. I love their majolica style. The scarecrow has been around for a while. He'd lost his head somehow but it's been glued back on. The leaf dishes are Spode. Bittersweet runs wild through the vignettes. This squirrel is a cutie. I picked him up during a junking expedition with my brother, Dave. He's really a for hiding a key on a porch. I've got more to share. I'll share a little more on Wednesday. For now, check out my other blogging friends. Cecilia @ My Thrift Store Addiction Cecilia is a kindred spirit with her junk store finds. Check out how she incorporates thrifted finds into her fall wine and cheese picnic. Next stop in to see Barbara @ French Ethereal. 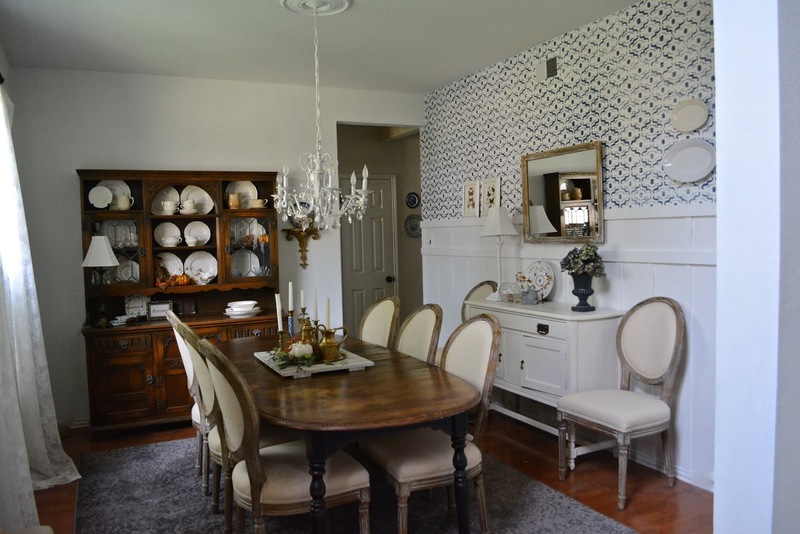 You will love romantic style with French elements in her little Texas home. 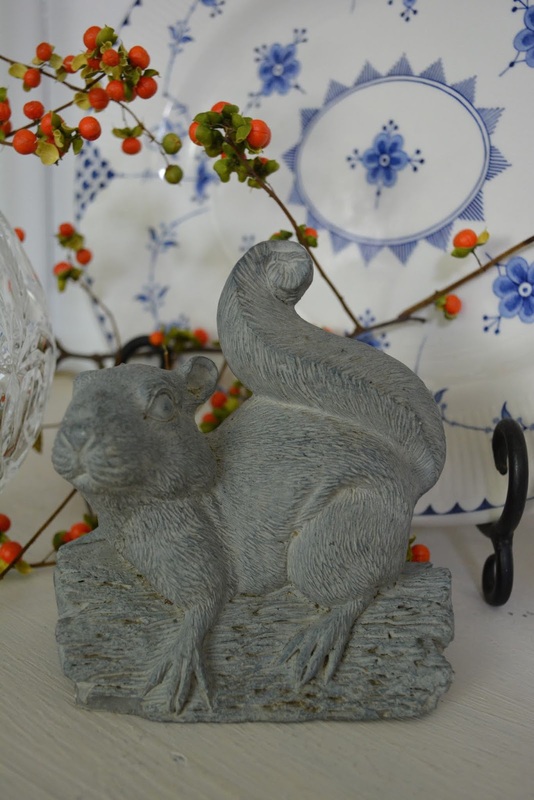 Stop in to see Laura @ Decor To Adore. 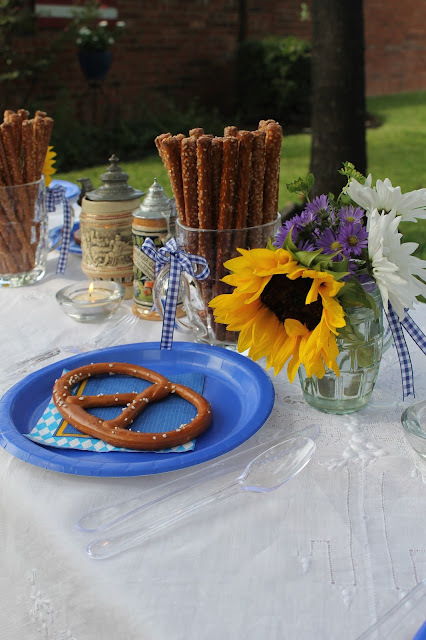 She shares a darling Octoberfest tablescape she created for her son's birthday. So cute. Laura is an incredible seamstress. Check out her period costumes when you visit her blog. I'm so glad that you stopped by. There will be much more inspiration throughout the week. These are the other blogs on the tour and when their posts will go live. So pretty, Katie! I'm smitten with your PB pillow. 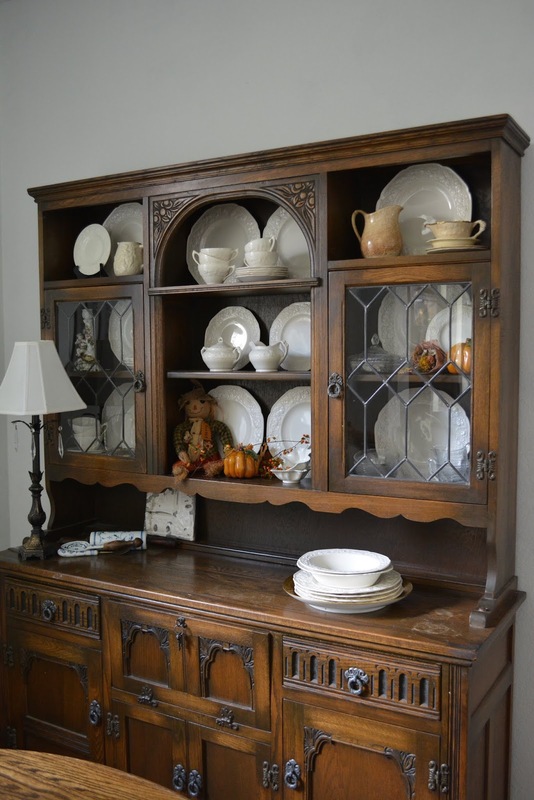 And see, now we're getting fall weather -- Mother Nature was just waiting for your Fall Home Tour :) Looking forward to this week, thank you so much for putting this together! xo! 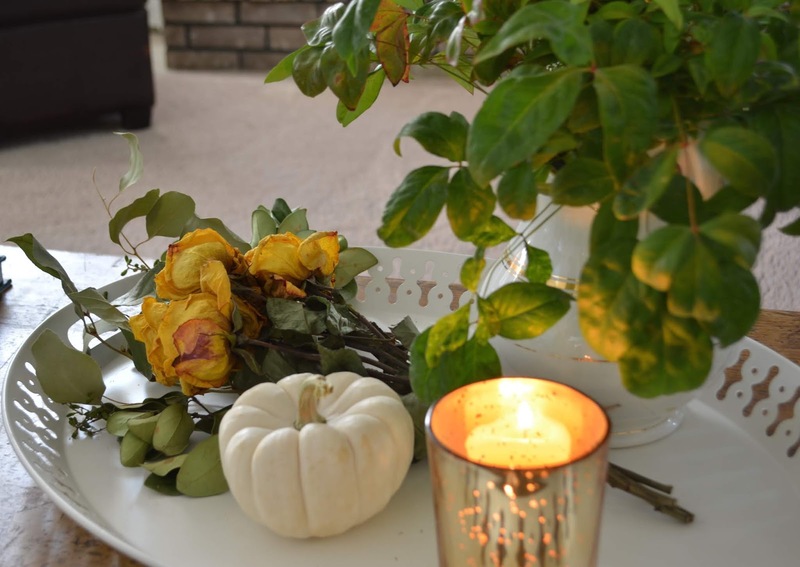 Your home looks beautiful all decked out in Fall decor, Katie! Your accents and vignettes look so soft and pretty. I have plenty of nandina in my garden, and I appreciate you for that inspiration. Thank you so much for organizing and hosting this tour. Katie I am in LOVE with your fall decor. That vintage painting is fantastic! Love the interwoven bittersweet. Thank you for hosting! 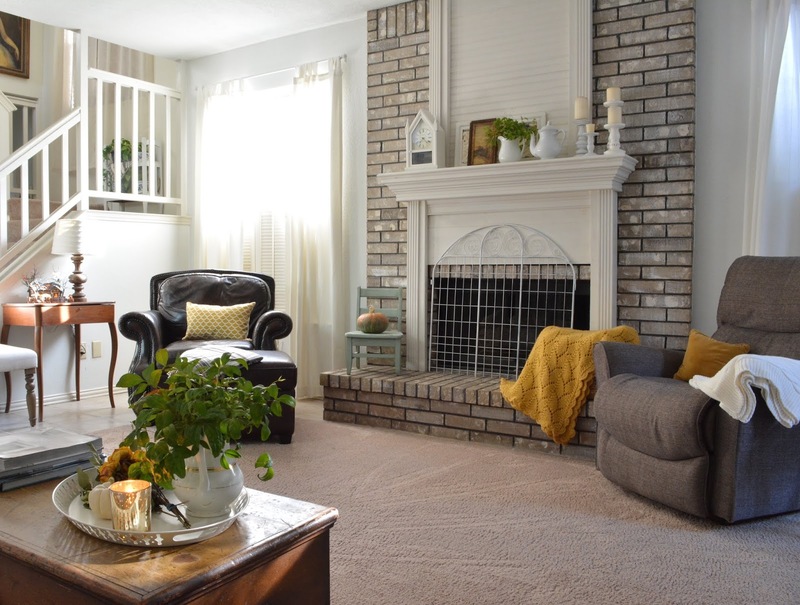 Katie, I love how you blend in vintage treasures with newer decor like your Pottery Barn and Magnolia Market pillows. Everything is beautifully done! As a pianist, I especially admire that gorgeous white piano and the cloches on top. I spot a little acorn in one of those cloches that I also picked up this year! ;-) Thanks for hosting us! 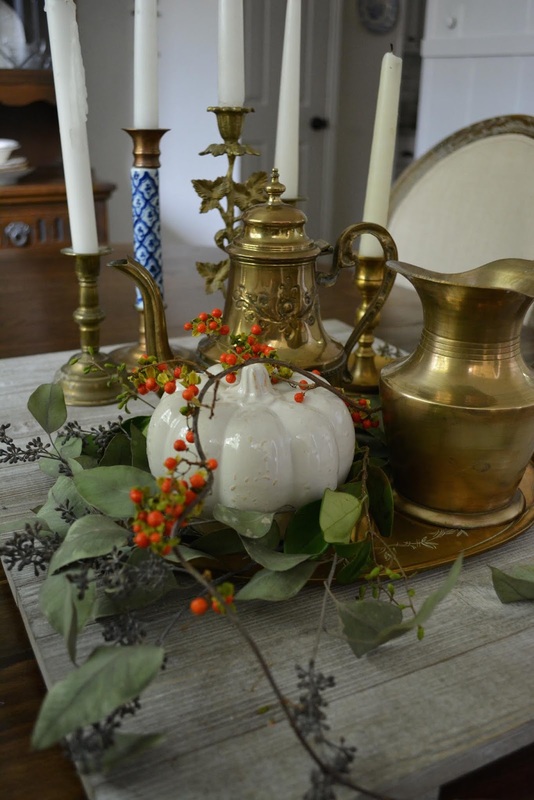 Katie, your little touches of autumn gold are so pretty! 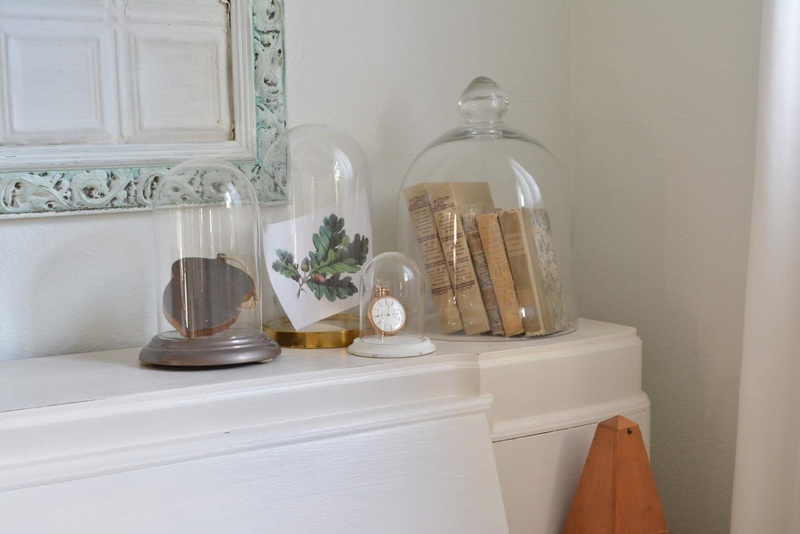 I also love the collection of cloches and all the books in the big one. You have a beautiful home and great ideas. Thank you for organizing our fall tour. Well, I'm falling in love! 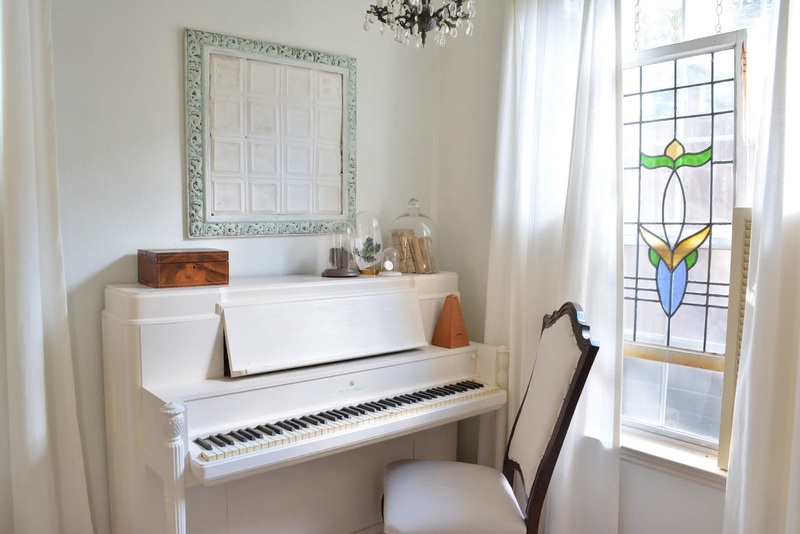 Your rooms are so pretty. And I just love that gold afghan! Katie, it's fun to see your home with all its fall touches. Thanks for organizing us and hosting this annual tour. It's always fun! Happy Autumn! 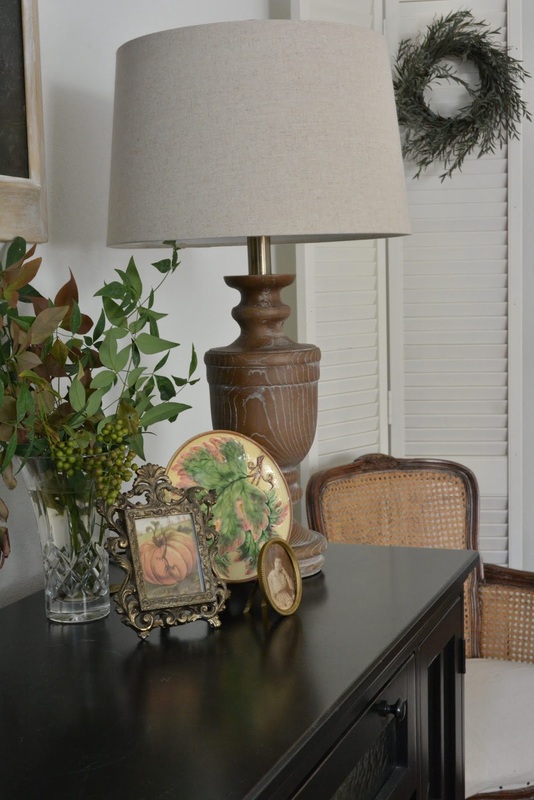 All the gold touches are perfect for Fall in every room. 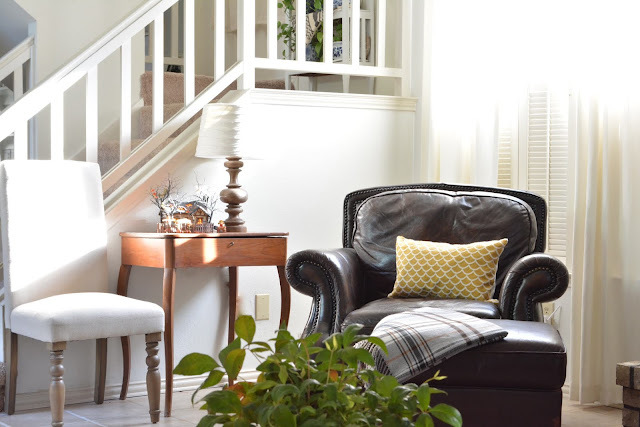 The sunlight streaming onto the leather chair even looks softer for Fall. Thanks for hosting a fun tour with all our Texas blogging friends. Your fall home is so pretty, Katie. Love the bittersweet with the white pumpkin and greenery. Thank you for organizing this lovely tour. Your home looks so lovely! I especially like those antique books under the cloche. Charming! Thank you so much for organizing this tour. I know it's a lot of work to put together, and we all really appreciate your efforts. 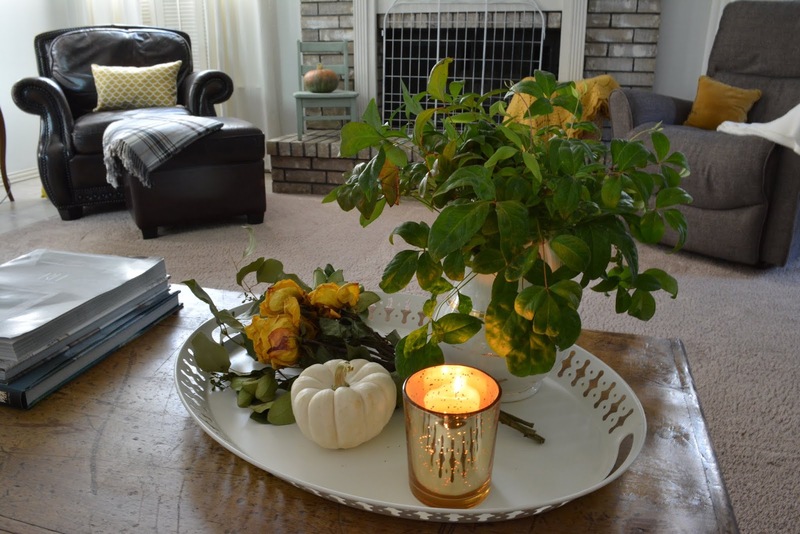 You have decorated your house so nice for fall. It’s such a beautiful time of year. Looking cozy, Katie! 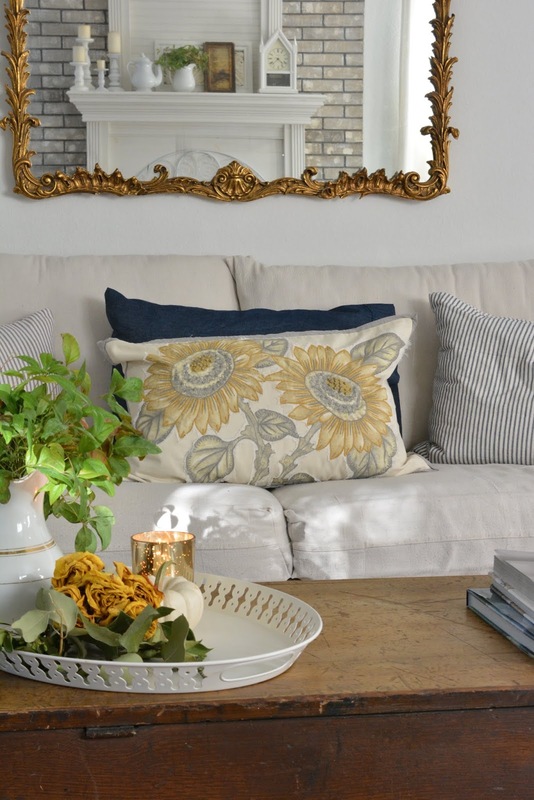 The sunflower pillow is gorgeous! Katie, you have great touches. Love the use of inherited pieces ~ the pillow, the throw. How special for holiday season. Thanks so much for hosting. Your fall tour is simply lovely. I love that you chose a golden hue- the old painting is gorgeous.